* that Cerebus-related crowd-funding project got over in a big way. I'm not surprised; it seems Dave Sim is perfectly suited for that kind of funding effort. I also think the premiums were good on this one. 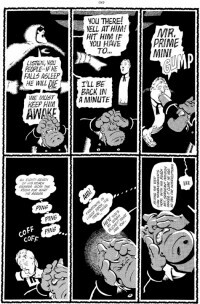 The book itself seemed like a worthy project and priced at a decent point you could just enter into it that way, and all the extra stuff being offered seems to have fairly hit the sweet spot of certain Dave Sim fans for all the extras that a focused Dave Sim is able to generate. That should also be a project worth following just to see how Sim approaches a new way of publishing. His approach to Direct Market publishing was certainly one of the most influential. * this fundraiser for a project encompassing the early works of Don Rosa looks well on its way to meeting its goal. That seems like a good project to me. Those are fun comics, they are very far removed from the North American market at this point, and Rosa's an important creator who should have as much work as possible in print. * that ambitious-looking Silver Cord fundraiser looks like it could use some attention from any interested fans. This P. Craig Russell-related project could also use a push although the amounts here seem eminently achievable if there's even a modest amount of interest. * Zach Roberts and Russ Burlingame are trying to do a photos-book related to SDCC. That's different. * finally, this Amy Reeder project seems well on its way to full funding.